The client is a global legal services provider, with offices in 24 cities across America. They assist clients with their most complex and demanding legal and business challenges worldwide. They provide legal services in areas such as banking and finance, corporate and securities, litigation and dispute resolution etc. 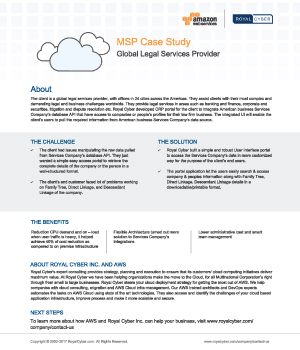 Royal Cyber developed CRP portal for the client to integrate American business Services Company’s database API that have access to companies or people’s profiles for their law firm business. The integrated UI will enable the client’s users to pull the required information from American business Services Company’s data source.